Competing chants of "we can't hear you" reverberated throughout the Newberg High School gym and the difference in decibels between the two student sections was indistinguishable. After nearly three quarters of fluctuating score lines, the game was also tied in a 30-30 tilt between Newberg and Yamhill County archrival McMinnville. As the teams traded misses and the quarter came to a close, the volume reduced to a conversational buzz. Ahead was what was likely to be an eventful fourth quarter between two old rivals. 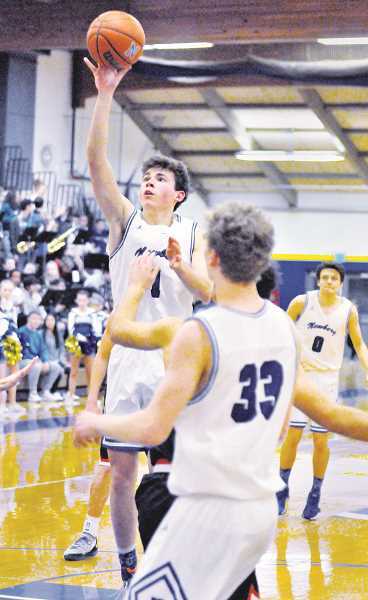 Spoiler alert: Newberg pulled out a three-point victory in front of its home fans on Jan. 25, making all the right plays down the stretch and picking up some much-needed momentum. The Tigers (7-10, 2-3 Pacific Conference) are fully healthy for the first time this season. They needed all of their playmakers to beat the Grizzlies (7-11, 0-5). 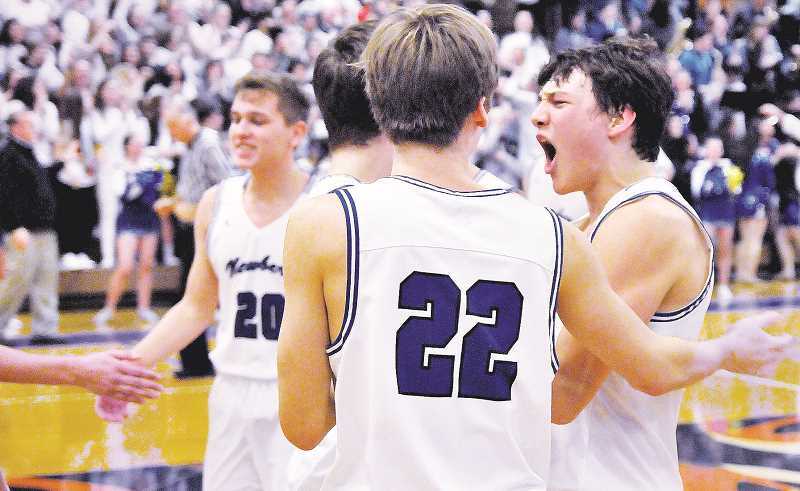 The atmosphere – as Newberg coach Mark Brown said he expected – was intense. "I finally sat down at the start of the fourth quarter for just a minute, took a drink and that whole side across from me was filled with fans and students," Brown said. "It's nice to have this rivalry back. Not having them in our league the last four years made it tough." With 3:30 remaining, McMinnville senior guard Luke Arzner – who dazzled all night and finished with a game-high 30 points — scored an and-one to give his team a 41-40 advantage. The Tigers responded with a two-pointer, and so did the Grizzlies, making it 43-42 in the road team's favor with 1:25 to go. Thirty seconds later, Newberg senior forward Alex Jaczko nailed a turnaround jumper from 15 feet. A timeout led to an empty possession for McMinnville as the Grizzlies were forced to foul. An unlikely hero made the stop, which prevented Arzner from scoring 1-on-1 – a junior. "In the moment, I turned to Zach Macris," Brown said. "He's playing primarily JV, but he's been a part of our varsity program. We know we can rely on him as a great defender – and he showed that on a big play in the game. For the 30 seconds he was in there, he did exactly what his team needed." After Macris and company made the stop, McMinnville needed to foul three times in order to force a 1-and-1 situation. The Grizzlies never had the chance to force it; 20 seconds later, Jaczko was fouled on a layup attempt, earning two shots at the line. He made one of two, giving the Tigers a 45-43 lead with 15.3 seconds remaining. Arzner pounded the ball up the court for McMinnville and drove to his right. Multiple Newberg defenders cut him off at the baseline as he hit the deck, looking for a foul call. The whistle blew. Out of bounds. Newberg ball, and Jaczko was subsequently sent to the line with 6.9 seconds left. First one: Good. Second one: Clank. Parker Spence secured the rebound for the Grizzlies, took it to half court and dumped it off to Arzner, who took three quick dribbles to the right wing for a contested three-pointer. "We felt the pressure going to school every day for the last week," junior guard Jack Chlumak said with relief. "Obviously it feels nice to get it off our shoulders, and it was a good win. Proud of these guys." Chlumak had 10 points for the Tigers, joined by Jaczko (13) and senior guard Caleb Muthiah (11) in double digits scoring. Both Jaczko and Muthiah have been nursing ankle injuries and were back in uniform for just the second consecutive game – the first being a 69-31 walloping of Glencoe on Jan. 22. "Tuesday night was the first time all year that we had all our guys in jersey," Brown said. "Against Mac, I felt like we were at full strength. The guys who had ankle injuries are still trying to get their game legs back, but we have our guys ready to go and competing. I think we've shown what we can do – we've just got to do it consistently." It was a low-scoring game for Newberg in large part due to McMinnville's defensive pressure. The Grizzlies led 9-6 after the first quarter and consistently prevented entry passes to the post for much of the first half. Both teams embraced the atmosphere, even as they struggled to score. On big shots, stops or key plays, Tiger and Grizzly players displayed an extra level of emotion – as is expected in a rivalry matchup with a lot on the line. "All the emotions that went into the game really set the tone," Jaczko said. "We've been playing against the same guys from Mac forever, and this is kind of everything you'd imagine from a high school rivalry game. Both student sections chanting and two guys from a similar area going as hard as they can." The Tigers are confident heading into the home stretch of the regular season. Brown and his players believe they are one of the best teams in the Pacific Conference, and that they'll be able to make a run in the final seven games. Newberg took a few days off in order to study for final exams. The team plays on the road at Liberty on Wednesday night. After that, the Tigers return home to face Sherwood on Friday. "Once we hit our stride, we can beat anybody," Jaczko said. "Now that we're at full strength, I feel like we can be the best team on the court most nights. That confidence will really help us – we've just got to take it one game at a time."